I’m going to start this post reiterating to myself to never base a trip on the weather forecast, unless maybe there’s a hurricane or tornadoes. Fool me once, shame on you, fool me twice, shame on me. This was planned as a 2-day, overnight, 2-section outing. We were in the clear to get on the trail yesterday to do section 5, and stay the night at either RPH or Shenandoah tenting area if it was full, and do section 6 today. We knew it was going to rain. That was a given, and a factor we are well used to by now and really don’t mind that much. It was just that this forecast called for 100% chance of rain from 1pm yesterday to 8 pm tonight, with potential 38 mph winds. That just sounded downright unsafe, let alone miserable. Being section hikers, we have the luxury of altering our plans accordingly. In fact based on this forecast, we almost didn’t go. I had gotten the time off already so I thought of maybe a trip to the Pequot Indian museum — a place I’ve wanted to visit again since going as a kid. I’m fascinated by Native American history and collect Kachina. However something must have been going on at the casinos there because every hotel with rooms under $200 a night in the area was booked. Then we said you know what, no, we are going. 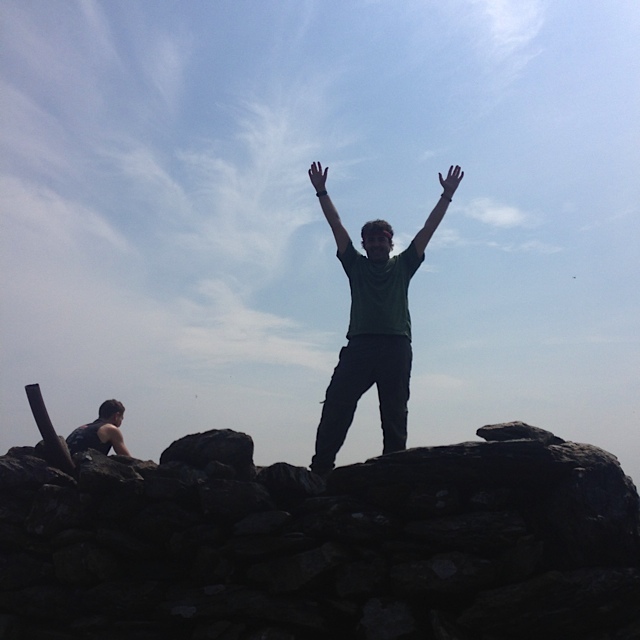 We will just do a day hike, get one of the two sections done, check out RPH for next time and sill have a great time. It’s only an hour away. And we DID have a great time. We had a great hike, some beautfiul views, a nice chat with some local section hikers (Quicksilver, Skylark) and despite some rain, ventured on a bit into section 6 to check out RPH (Ralph’s peak hiker cabin) shelter. That place is amazing. It’s right by a road and you can order pizza or chinese there, there’s 3 bunkbeds, a desk, a covered patio, picnic tables and chairs, a large lawn for many tents, a water pump and a colorful outhouse. There was also a case of beer of trail magic from the night before, so we had a beer and signed the register before we left. As we drove back, the rain steadily increased. It rained all night, and we told ourselves that we made the right choice. I did hear some wind last night. But to be honest we’ve spent many nights in our tent in a downpour, and woke to a drier morning to pack up and hike out. In fact just last time at Sages Ravine was quite a storm. But at RPH we could have had a great meal under the porch, socialized for several hours, and ran to the tent for bedtime. And we were lamenting this fact as we sat under the porch enjoying the beer. On the bright side it wasn’t the first and it won’t be the last trip of the season. 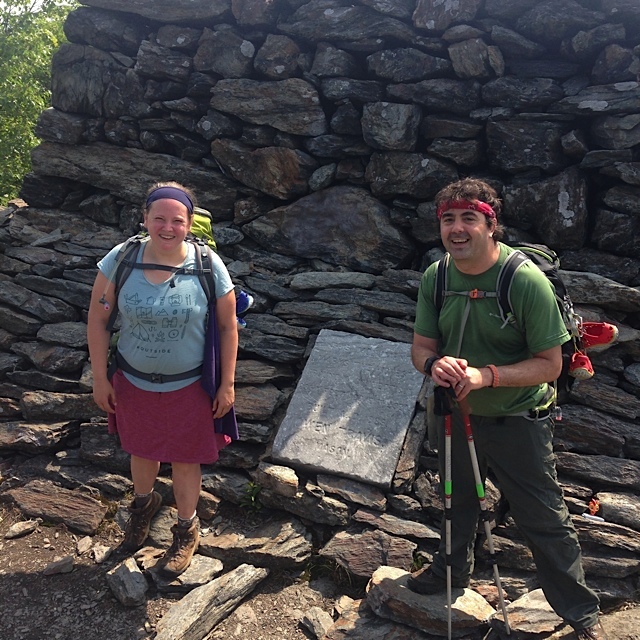 We’ve already done 3 overnights since April, covering 25 miles of the trail and in doing so checked one state off the list and a nice chunk of another! Also we are taking my family (my little brother is visiting with his boys from L.A.) to car camp and do the Pine Knob Loop for the fourth of July weekend next weekend, then taking my son “Jiffy Pop” to do section 4 of NY (we skipped it to save it for him) two weeks later. Another few weeks later we will be in Harpers Ferry and also southern WV for a wedding and will try and complete the 6 miles of that state with him. We’re already talking about doing an overnight starting at RPH after work on a friday night, and then hiking out this section the next day on one of the weekends in between in July. We have a 3-day 2-nighter planned to finish sections 8 and 9 with friends and make it to Bear Mountain NY in mid-October. And race and Everett in the Berkshires of Massachusetts in September – though we could switch that to section 7 of NY if time is more constricted then and get back to Massachusetts next season. 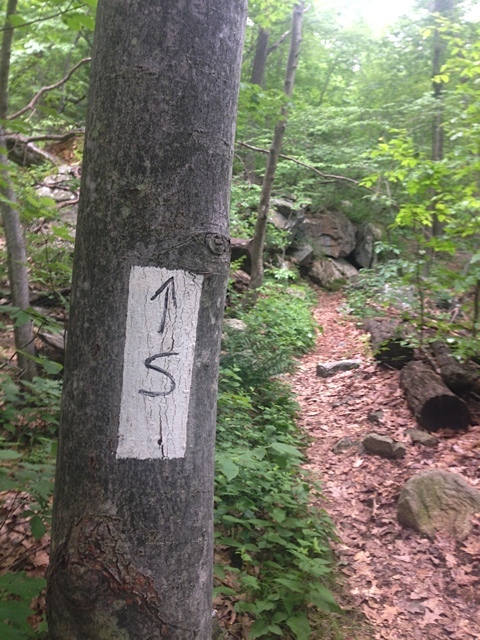 My goal by the end of this season is to have covered all the trail from the Mass line across the Hudson to the top of Bear Mtn NY. 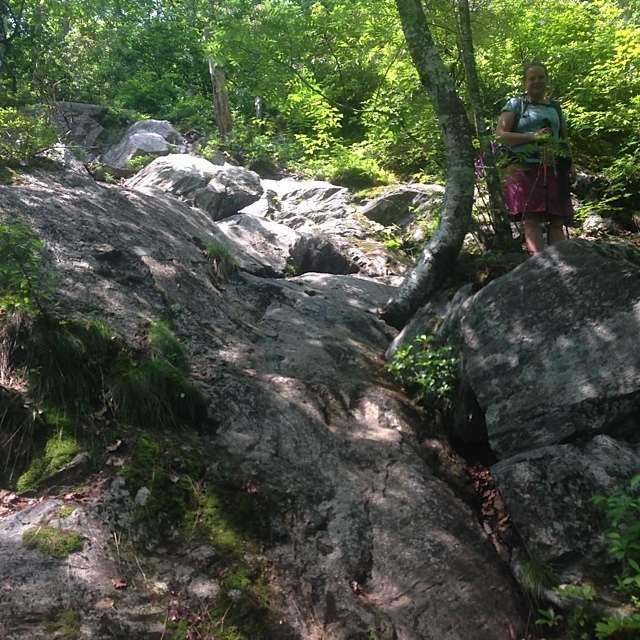 We did the trail from the Inn to the top of Bear a few years ago already, and the awesome and steep Major Welch trail. We did Connecticut northbound but are doing New York southbound. Simply because of its proximity to our home. Also, the trail maintainer, “Elvis Trailsley,” does a fantastic job of trail maintenance. 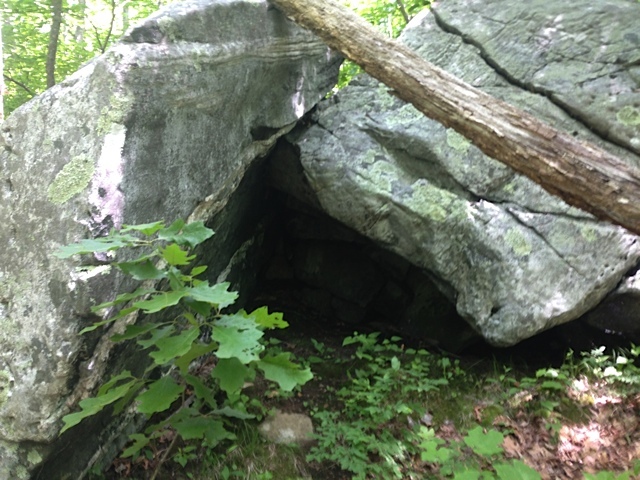 There were many lovely corridors of placed stone and log benches, many cairns where we and other hikers are clearly enjoying adding stones to, and many small blazes on rocks in mid-trail so there’s no risk of ever losing your way. Trail magic from Loggman! 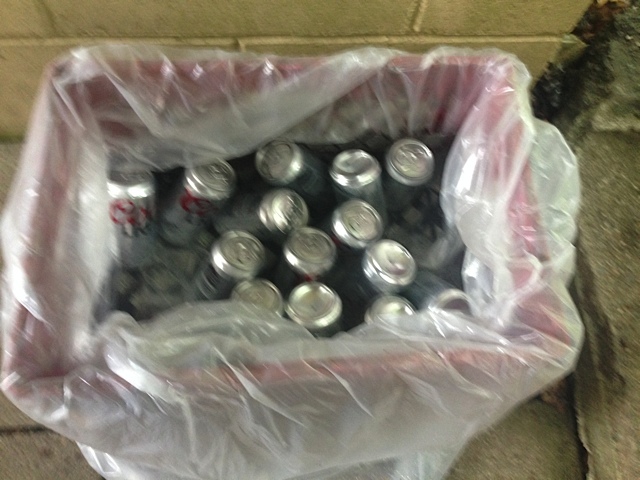 Tap the rockies! 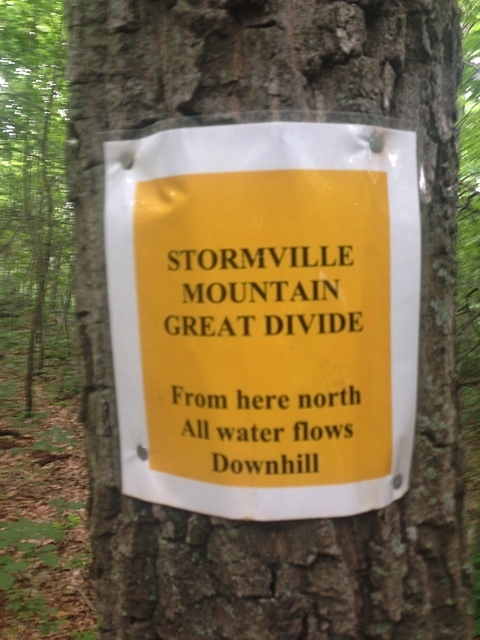 He had an interesting sign on Stormville about the divide and water flow, and one at the creek by Hosner mountain road warning hikers of the danger of not treating the water there due to the farm upstream. We love seeing the different personalities of the maintainers of the different sections, and this man does a fine job! Thank you. 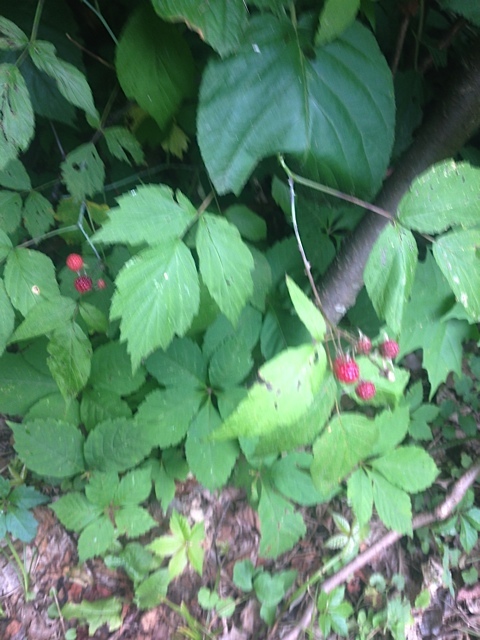 We saw and tasted our first wild blackberries of the season, and tromped through some beautiful fern gullies and hemlock groves. And got very excited for doing this next section knowing how special RPH is. Heck, we dont even need to bring our full packs if we did it that way! We could load up our car with trail magic and treat everyone that night if we wanted to then just leave our sleeping gear in the car and day hike that section. We will see! We’ve wanted to return the trail magic for a while. Distance sign at RPH, not far to Bear Mtn bridge! I’m going to appease myself that I’m not hiking today by taking this opportunity to go to REI’s 4th of July sale and get some outdoor gear retail therapy! Need some more fuel and mountain house anyway. And, I get to spend more time with my kids today. 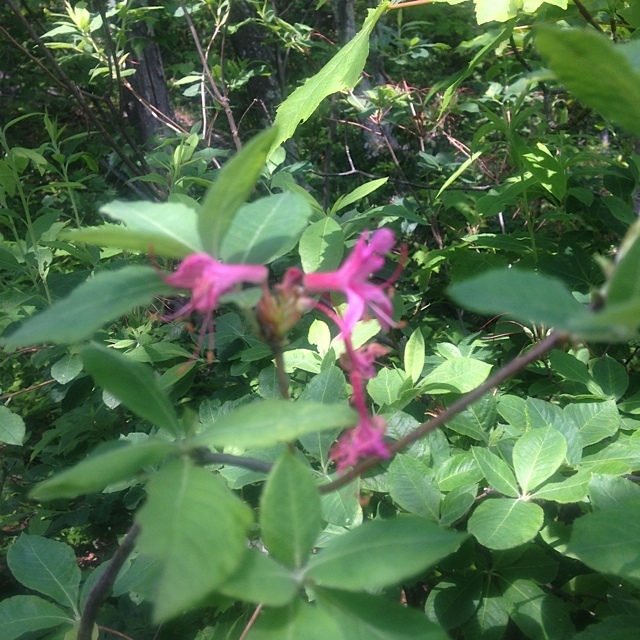 We will have lots of guests on our hike blog next weekend. Until next week, happy trails! Hi all – this is Fielden Stream reporting in! Just wanted to add my own info on our recent hike. 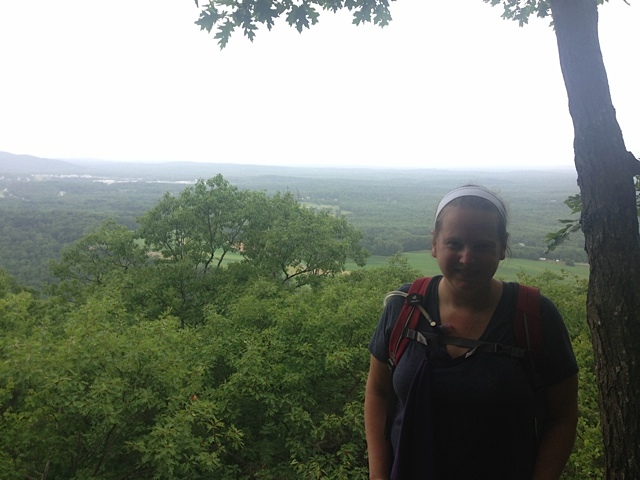 First off – I was very worried about this hike as there was going to be a lot of steep sections and it was going to be the second 2-nighter that we had ever done. So we truly underestimated our abilities here – mostly to be on the safe side. This ended up meaning that we got to both of our campsites super early, which isn’t necessarily my preference, but it ended up being a nice relaxing addition to our trip. This was especially true the second night as we had a gorgeous brook called Sages Ravine running right near the campsite with watering holes and 14 beautiful waterfalls. But back to the first night. Riga Shelter I guess is a very popular campsite mostly because it has a nice view. 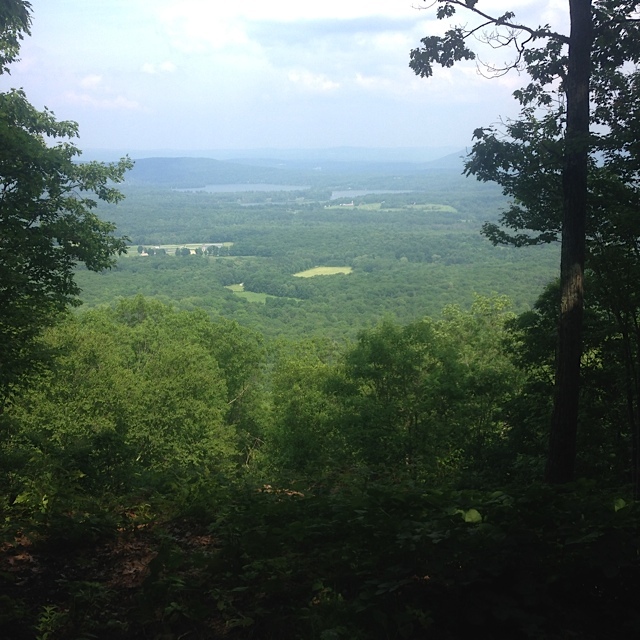 It also has some private campsites that are surrounded by trees so you really don’t have to spend time with other hikers if you don’t want to. The privy was pretty decent too although it did smell a bit. The only thing that marred the beauty was the semi-burnt shelter (some idiot in January did it), but the trail maintainers are supposed to be fixing that this weekend. It was a bit buggy though. I also didn’t like the fact that you had to walk pretty far to get to the beginning and to the privy from almost everywhere (although Sages Ravine was even worse!) There was also no picnic table – which isn’t a deal-breaker, but does tend to add a nice element. And we did meet some more nice thru-hikers (AYCE, Buster and Sparkles) while we were there which always makes it a more fun trip. 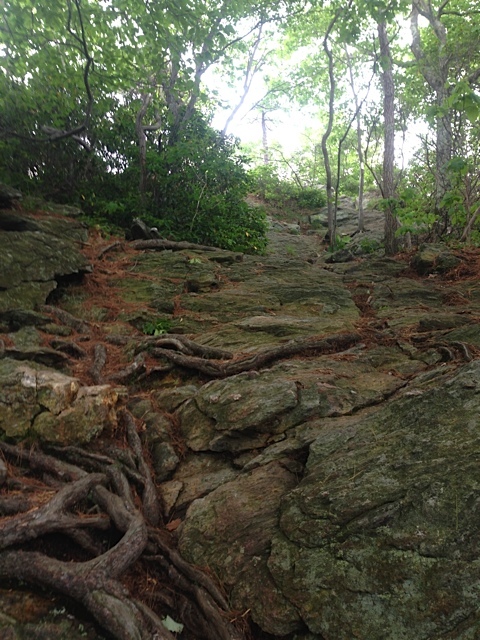 The second night — after a heart-attack-causing decent down Bear Mountain — was at Sages Ravine. This campsite does not have a shelter so you don’t have too many thru-hikers staying there. They do have a camp steward though who lives there for a few days every week (they rotate them through) which was interesting as we got info about the area and some of the issues of maintaining trails. Everyone who can should volunteer to maintain trails as If you love nature it’s a great way of giving back! My biggest problem with Sages was how far (and uphill!) every campsite and privy was from everything else. I think we did more mileage walking back and forth from the campsite to the brook to the privy and back again than walking the actual trail! The privy was also on the lower quality scale. It was composting, but it had not been updated in quite a while and there was a big rock holding the door shut, which you had to move in order to get inside. And like I said, it was at least an eighth of a mile from our campsite. But our campsite was nice. We decided to set up at a group site because we wanted some company, and we got some! We also got a nice view of a side ravine and a nice breeze that helped keep the bugs away. And quite a thunderstorm when we were happily tucked away in our tent for the night. Many of the other campsites were up on a hill even higher than us and were in the middle of fields of grass. Personally, I’m not a fan of camping near grass because of snakes and ticks. But the best part of Sages was the brook itself, and washing our feet in the deliciously cold water. I could do that for hours. All of my blisters stopped hurting for for like 5 minutes! The third day we got up super early so we could go have lunch at a restaurant later. I couldn’t wait for hot food and a real bathroom. The hike out was on a side trail called Paradise Lane and I do have to say it was very paradisical! 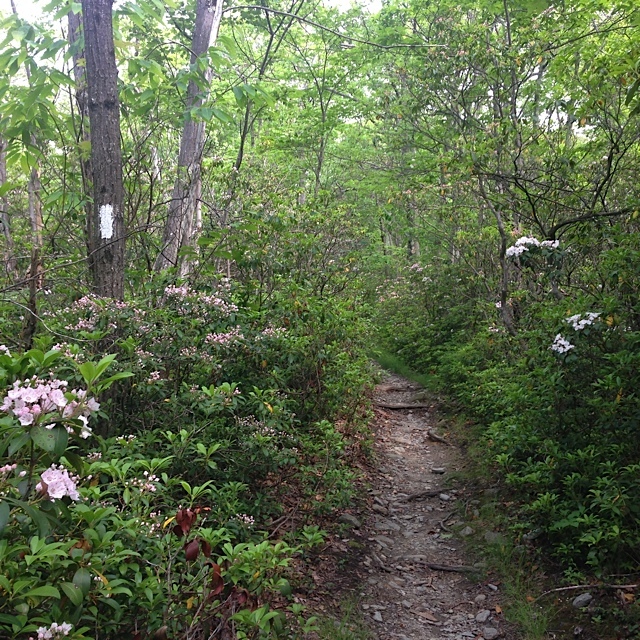 The Mountain Laurel, which is the CT state flower, was just reaching peak and it was stunning to walk through archways of them. There were also some very pretty swampy areas with bullfrogs talking to each other. And then it was on to our delicious lunch at Toymakers Cafe in Falls Village. If you go, get the sausage and biscuits. They were outstanding!!!! As we finally finished the state, we put up our video and you can view the link to it on our new youtube channel. We hope you enjoy it, though we are admittedly not film directors. This weekend we went to do a little car camping with my son at one of our favorite campgrounds along the Connecticut A.T. corridor, Housatonic Meadows State Park. The park is located along the river just north of the crossing of Rt. 4 in Cornwall Bridge, and just north of the Mohawk Trail crossing and the very popular Pine Knob Loop. 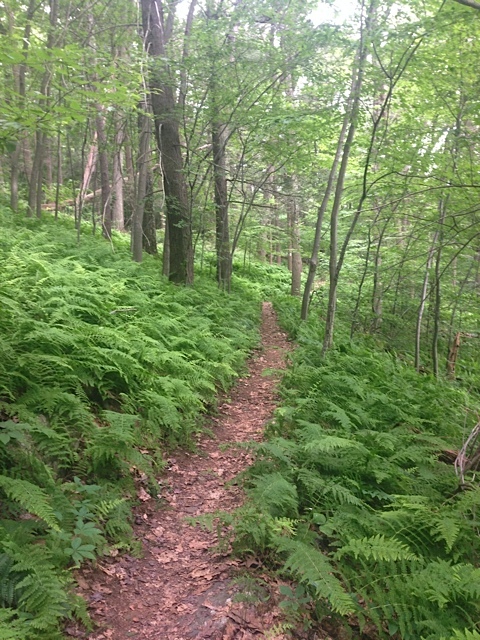 It was National Trails Day on Saturday, but really the whole weekend it is celebrated. While I’ve been out on hikes on the actual day, it gets crowded, and this was proven by the full lot at our trailhead which we passed on the way to the campsite. We were happy to wait one more day as the forecast was grand for both days. Before we arrived at the campground, we stopped at the very hiker-friendly Cornwall country market for lunch from their deli and to get our A.T. passport stamped. 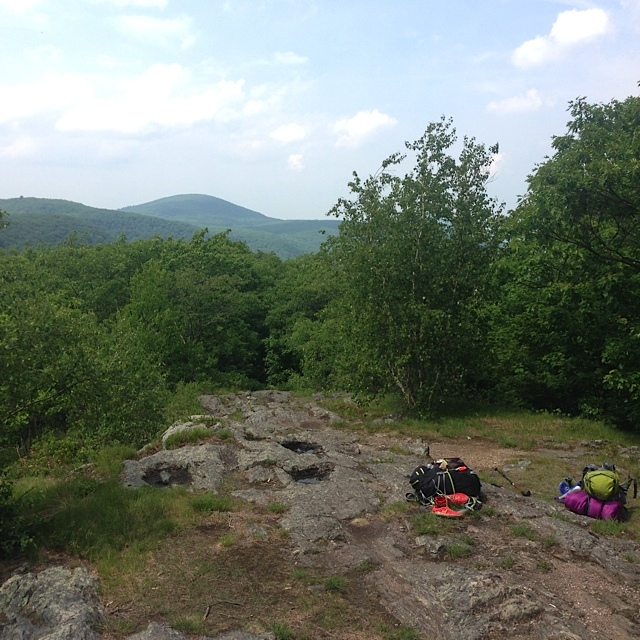 We didn’t have one last year when we backpacked through town on a section hike and stuffed our faces with greasy sandwiches here, got some additional food and headed up this very mountain for an unplanned night further up the trail at Caesar Brook campsite. While no Silver Hill, it was fun just saying the hell with it let’s get more food and keep going! 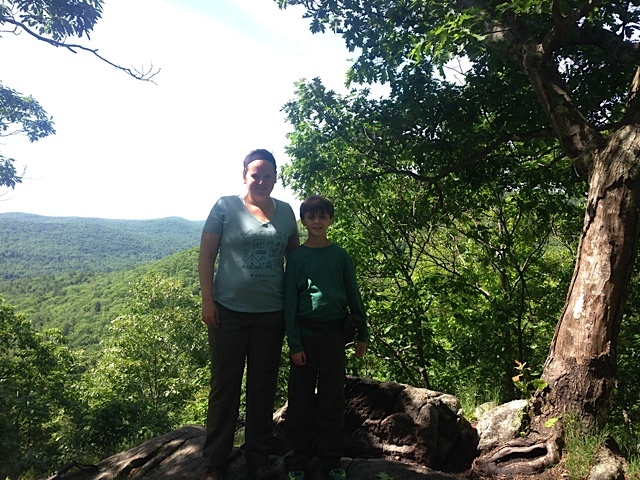 We’ve been to this campground a few times and enjoyed a hike up Pine Knob loop already with my son. That loop also takes you up to and includes part of the A.T., great views and skirts the lovely Hatch Brook along the way. 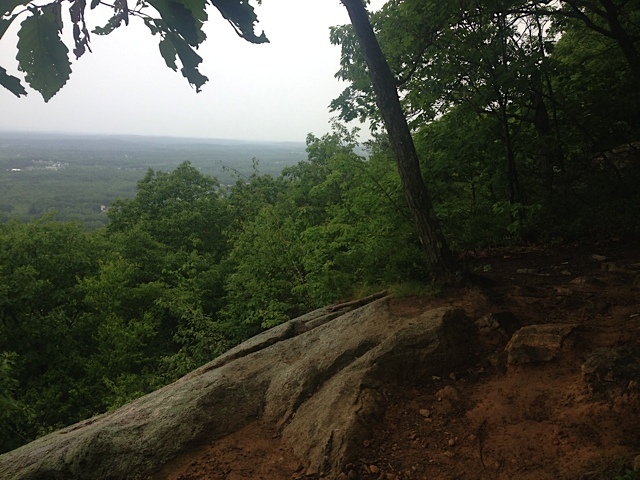 I had visited the top of Breadloaf mountain for the first time since Boy Scouts when we did that section through here last summer, and again this past January to test my microspikes and get in any hike at all when my trip to Alander was cut short due to dangerous road conditions. Back when I was a kid, if I am remembering correctly, this was still the A.T, but it was rerouted west of the river since and so I remember this steep climb as part of the A.T. 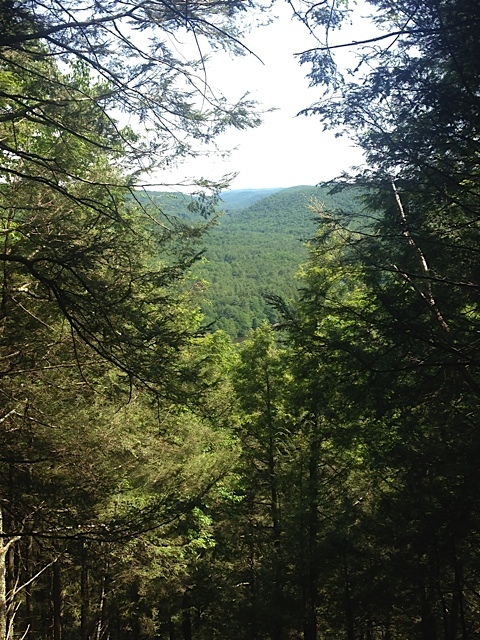 If memory serves, several tornadoes whipped through the area in the late 80’s ( about 5 years after my scout hike here) and did a lot of damage to the beautiful Cathedral Pines part of the trail which we day-hiked over to Mohawk Mountain last summer. This former portion of the A.T had several other famous views including from the top of Mohawk Mountain Ski resort, Music Mountain, Dean Ravine, and Barrack Mountain before it dropped you in Falls Village. Since the re-route, it’s called the Mohawk Trail, and many people still do the loop from Cornwall Bridge to Falls Village and back via the old and new routes. Many of the shelters from the old days are still on the Mohawk Trail, but hardly used. 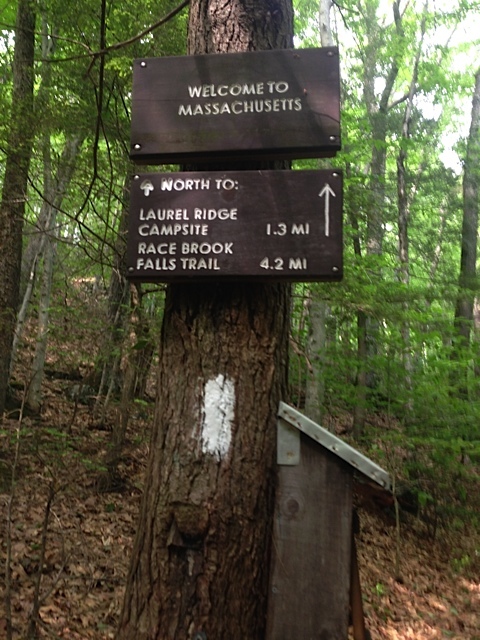 While today’s was a short hike, It starts with a 650′ rise in .6 miles from the Mohawk trail head with a quite steep climb at the very end to the summit. 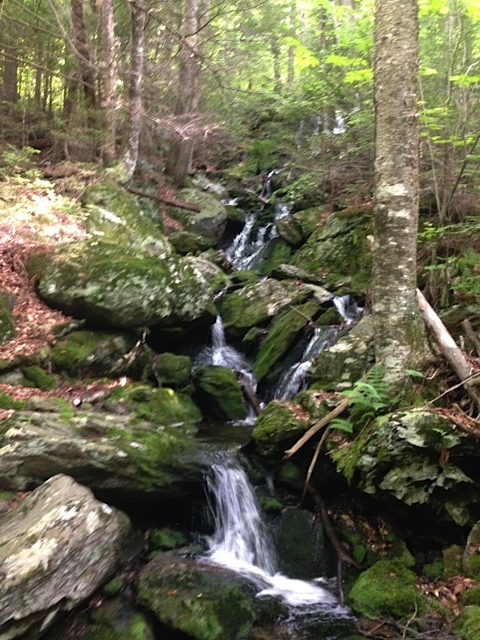 Though you have rewarding views from there to both the north and the Housatonic river, and south to Silver Hill and beyond. After a snack break at the top we headed down to the A.T south and then took the blue-blaze on Old Sharon Road, for those not wishing to cross Guinea Brook. While I crossed it coming northbound on the section last year, the crossing can be treacherous as the stones continually get washed asunder or covered with the fast current, and walking down Rt. 4 is a dangerous game – people drive way too fast coming in from N.Y. We looked down at the brook when we got to the crossing, but as usual, it was quite fast and full, and I wanted to avoid the road, for all but the last .1 mile, so this gravel road was the way back from the A.T. for us. 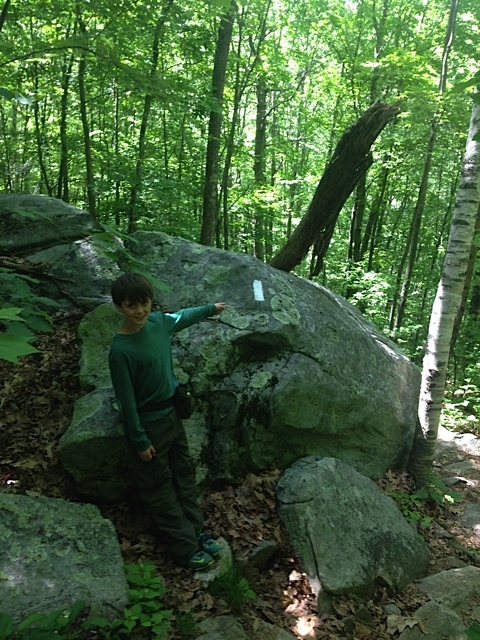 We have done many great day hikes with my son, and have gotten him a great new backpacking set up, and he will be joining us for New York section 4 in July. 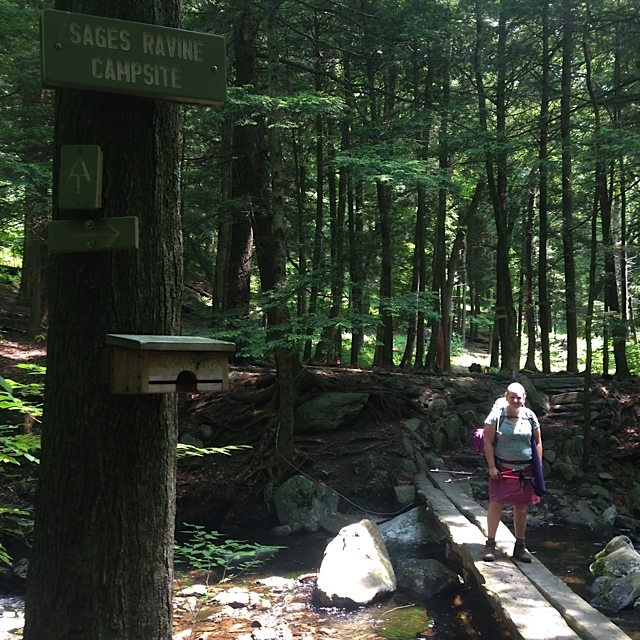 So we wanted to get his hiking legs back for that hike, as well as warm ours up for our 3 day-2 night section hike to finish CT Section 1 — the last of the Connecticut A.T for us — this Thursday. Looks like we will be greeted with the usual – rain and thunder, but I’ll take it over the office any day. We also had the chance to give him his trail name, “Jiffy Pop.” He’s a popcorn fanatic, and nothing is more fun when car camping than some Jiffy Pop. We enjoyed some last night at the campsite, and as he hurried up the trail’s steepest segments leaving us in the dust, I thought he sure got there in a jiffy… so, a trail name is born. Can’t wait for his first backpacking adventure. He loved trying on and getting his hands on his new Thermarest Z-foam pad, his REI Passage 38 pack, Lumen sleeping bag, and his new convertible hiking pants. He brought the whole setup to the campsite so he could get used to the feel and packing it all, even though he didn’t bring it on the trail this time. Though he did impress me with his skateboarding skills while wearing his full backpack set up! 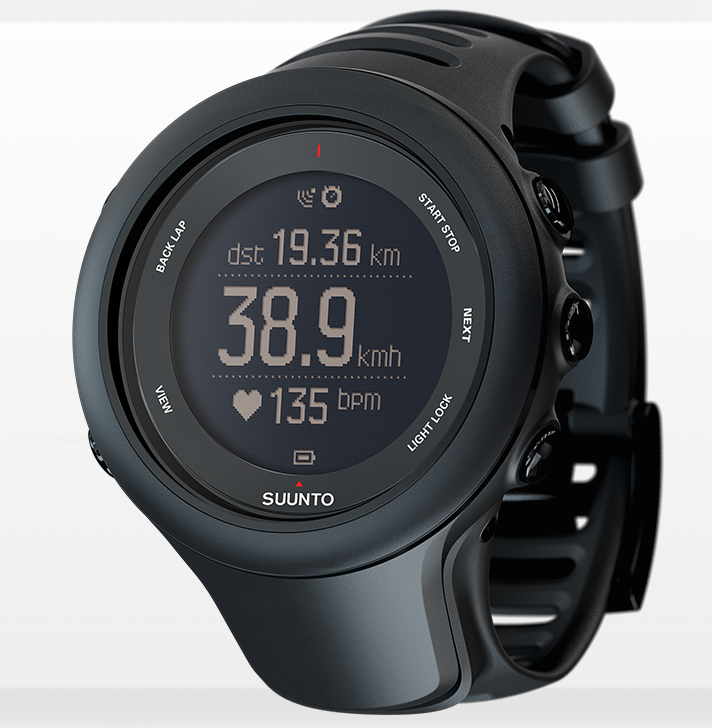 I want to take this last moment to plug my favorite new toy in the world – my Suunto Ambit 3 sports watch. This watch carries a hefty price tag, but I had previously gotten a Garmin Oregon 600 GPS for Christmas and I traded that in towards this so I only paid $150 for a $400 top of the line GPS and activity watch. And to be honest I had no interest in uploading maps or using the Garmin for navigation, I only used it for tracking hikes to save my phone battery from GPS drain and to try a new device. I found it bulky, and more than I needed since I was always going to be on well-blazed eastern trails. It was also always getting bumped when on my pack and re-setting the screen. If I need to see my location on a GPS map I can use my Alltrails app on my phone briefly. I wanted something where I could have one device, hit a button at the beginning, hit it at the end, and still see my basic essentials like altitude, distance, time, and so on when I needed to without constantly missing the scenery to play with the device. And, download my tracks after. 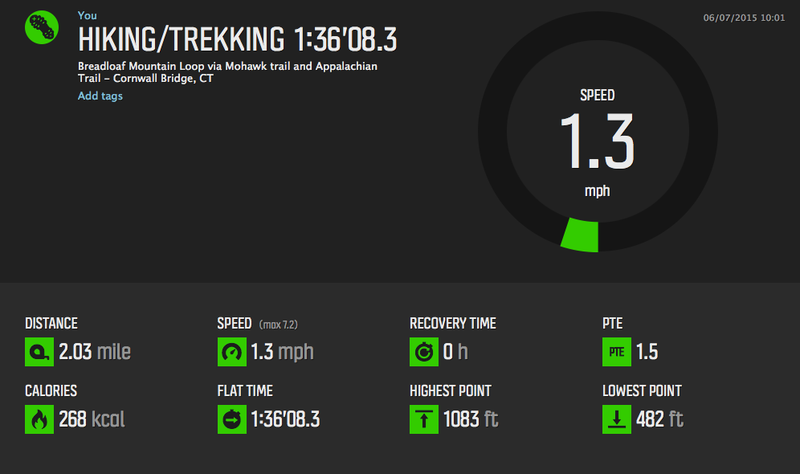 I asked at my REI for something with this capability and while the Garmin Fenix had most of these bells and whistles, you can’t export tracks as GPX files as far as I know. Syncing the watch loaded my activities and data preferences, and I tested it for the first time at the local Memorial Day parade. I plugged it in after tracking and saving the parade route I walked and instantly all my data, including the map, were on their website, and there for me to not only get approval from the community of users on my awesome journey, but I was able to export as GPX and upload to my alltrails profile. Amazing. I believe there’s about 15+ hours of battery in GPS mode, and I’m hoping for more. I’ll test that this weekend on 3 different days of hiking. I have my phone when the battery does die, but I can’t wait to push its limits and see. There’s also a programming language all its own and thousands of users can and do develop their own ‘apps’ for tracking favorite activities which any owner can download to their watch. Brilliant. This is the coolest thing I’ve ever owned. Glad I got it at a steal. Can’t wait for our adventure Thursday. 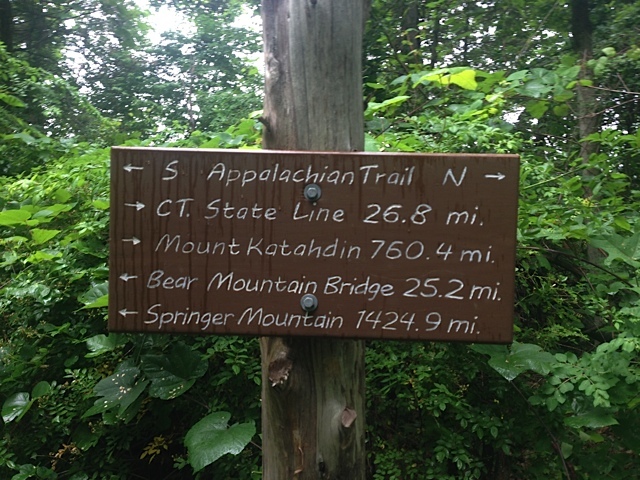 Finally finishing Connecticut and hiking over the highest single peak in the state and crossing the Massachusetts border will be a thrill. As always I wish we could keep going!